WASHINGTON — Sen. Kamala Harris is the potential 2020 Democratic presidential candidate generating the most excitement among the black political elite, according to participants at this year’s Congressional Black Caucus Foundation policy forum in Washington. It’s still way too soon for endorsements — none of the major potential candidates are even in the race yet and elected officials say they’re more focused on the 2018 mid-terms than the next presidential contest — but Harris, a California Democrat who is in her first year in the Senate, has emerged at the center of attention. In interviews with more than a dozen political insiders and CBC members here, Harris’ outreach to other political leaders, her attention to issues of importance to voters of color, her perceived ferocity, and even her status as a graduate of a historically black college — Howard University — were cited as reasons she’s emerged as an early, if far from prohibitive, favorite. "You’re hearing Kamala, and Cory’s a distant second," James Williams, director of federal relations for Wayne State University and a former longtime congressional aide, said, referring to Sen. Cory Booker, D-N.J. The early leanings of the black political influencers are important because a mostly unified African-American electorate has helped push the victors of the last two open Democratic presidential primaries — Barack Obama in 2008 and Hillary Clinton in 2016 — to the party’s nomination. Those contests highlighted the way party rules award more Democratic convention delegates to parts of the country that most reliably support Democratic candidates — meaning a black voting bloc can have outsized influence in picking the party’s nominee. That dynamic isn’t lost on white politicians who are considering presidential runs. Sen. Bernie Sanders, the Vermont independent who lost to Hillary Clinton in 2016, has been reaching out to the African-American community since his defeat, Sen. Elizabeth Warren, D-Mass., recently visited Martin Luther King Jr.’s Ebenezer Baptist Church in Atlanta, and New Orleans Mayor Mitch Landrieu garnered attention among Democrats, including many black voters, by removing Confederate statues from his city. There’s some division of opinion among black elected officials as to whether Harris or Booker would necessarily command the support of black voters if one of them ran. One potential African-American candidate who was an afterthought at the gathering this week was former Massachusetts Gov. Deval Patrick. Rep. Danny Davis, D-Ill., said “without a doubt” African-American voters would strongly favor Harris or Booker if one of them makes a serious bid and that he expects only one of the two would run. "I don’t think you’d get both," he said. But black voters won’t necessarily support a single candidate, said Rep. G.K. Butterfield, D-N.C.
"Booker and Harris are visionary leaders who enjoy broad support and respect in the African-American community," he said. "The black community is not monolithic, so political thought needs to develop on the next presidential campaign. We will look at the totality of candidates and seek to reach consensus on who can beat the Republican nominee." Many of the elected officials here would not discuss prospective candidates in depth on the record. Rep. Barbara Lee, D-Calif., who worked on Shirley Chisholm’s 1972 presidential campaign, would only allow this much when asked about Harris: "I like her a lot, but I like a lot of the candidates. … It’s very early." One characteristic that might help Harris in a Democratic primary in the wake of Clinton’s loss: Her gender. 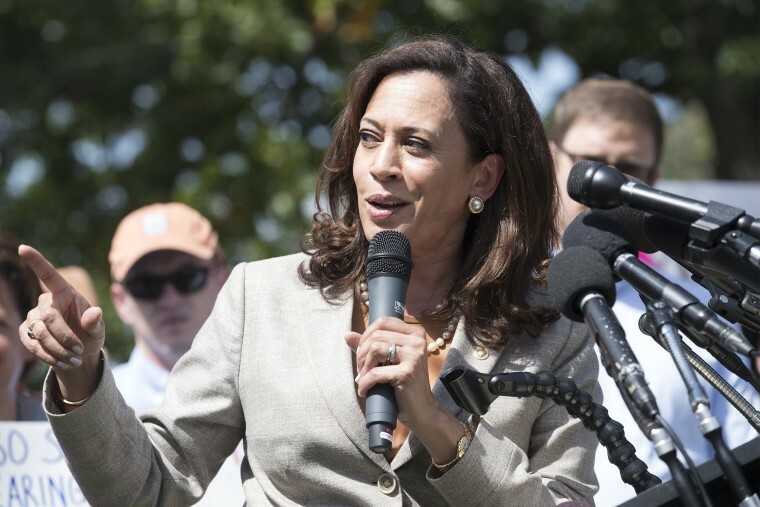 "Due to artificial encumbrances, the nation was deprived of its first female president," said Rep. Hank Johnson, D-Ga., pointing out that Harris is one of several women who might run for the White House. "Perhaps that can be addressed in the 2020 election." Because black women are more likely to vote than black men, they are especially important to Democratic presidential candidates, according to Andra Gillespie, a political scientist at Emory University in Atlanta. "You have to win over African-American voters, particularly African-American women, to be viable in a primary because they are going to be the ones who are going to be decisive in terms of allocating delegates to the convention," Gillespie said. However, support for Democrats among black women has fallen by 11 percentage points over the past year, according to a recent Power of the Sister Vote poll. Rep. Bonnie Watson Coleman, D-N.J., attributed the slide to black women being upset about the outcome of the 2016 election and wanting more from the Democratic party. "Black women are saying, ‘Look, we’re not going to be taken advantage of anymore. We know we’re integral to this party. This party better maintain its core values and speak to us in a way that empowers, and you better make room for us at the table at all levels,'" Coleman said. Marc Morial, president of the National Urban League, agreed Democrats have a lot of work to do to knit their political coalition back together. There’s "a real crisis in the Democratic party, and people gotta be more candid about 2016," he said. In last year’s election, Morial argued, Clinton didn’t lose just because then-FBI Director Jim Comey reopened an investigation into her email. Instead, a major factor was Democrats’ "failure to invest in African-American and Latino communities." Regardless of their own race, candidates can’t afford to ignore voters of color, said Paul Brathwaite, a former executive director of the CBC. "I think what folks are looking at is who is showing up and who is doing their homework," he said. "You need to be showing up and engaging in a genuine way in 2017, 2018 and 2019, not just 2020."